Being an Amazon seller, requires you to have a know-how of some of the technical stuff relating to the science and chemistry taking place behind this gigantic virtual marketplace. While operating in a brick and mortar store, you have the freedom and physical presence to influence your customer but selling on Amazon has its own perks. One of these perks are the Amazon Sales Rank. First, lets see what is Amazon sales rank? A simple answer to this question is the rank of a product listing in a category based on the sales of the item in that category. That being said sales rank depends upon the performance of the product. 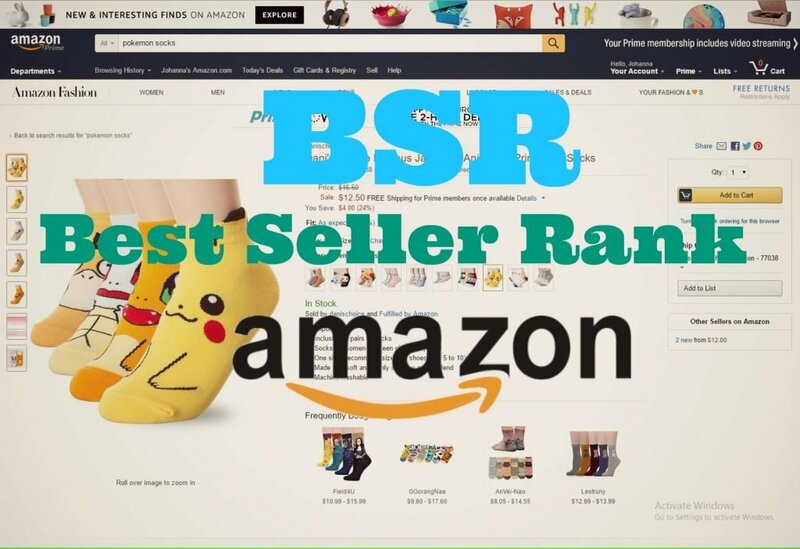 In Amazon, sales rank, aka the Best Seller Rank (BSR) is the rank of any product in the main category or sub-categories. A product can be ranked differently in main and sub-category i.e. It can have a rank #57 in main category and #23 in the sub-category. Lower the number, better the rank and that means more sales of that product. It also means that you can see how many products are selling more than yours. If your rank is #57 that means there are 56 products selling better than your product in the same category. Amazon sales rank directly affects the sales of your product, so you need to keep on optimizing the product listing and track the rankings with the help of an Amazon sales rank tracker tool. You can find sales rank in the Product Information area on the product page. How Amazon Calculates Sales Rank? Similar to Amazon buy box algorithm, sales rank calculation is also one of the secret algorithms of the Amazon which it does not reveal to the general public. But there are a lot of speculations by industry experts and top sellers explaining different methods of calculating BSR. The most common estimation is said to be the “sales volume” to calculate the sales rank of the product which means more the sales, better the rank. It simply tells that sales volume and sales rank of a product are interdependent. Some experts say, sales happened in the last 12 to 24 hours are considered for calculating the sales rank but we at AMZ Insight consider that there’s a much larger time frame of sales taken into account. Because, if a product is not sold in last 24 hours it would have to have same BSR which is usually not the case. But definitely, recent sales have more weight in calculation method than the older sales of the same product. How to Track Amazon Sales Rank? Amazon sales rank tracking is crucial because of ranking’s continuous jump back and forth in the searches. That’s why Amazon BSR tool was designed in a way that it shows you the history of sales rank in graphical way. Take a look at the figure below to understand how easy it is to see the fluctuation in the sales rank over the time. Simply roll over the data points to see the exact rank figures in the categories. You can simply add a product to tracking tool to start tracking the sales rank data. Over the time graph will be drawn based on sales rank history and you can see when your product performed well and when the sales rank dropped. Experts at AMZ Insight have always maintained a clear stance on how a product’s sales rank, plays an important part in determining the performance of a product. In addition to that, it is also sometimes considered that sales, revenue and the sales rank are directly proportional to each other. Well, quite a number of theories revolve around relating to the role of Amazon Sales Rank in a seller’s performance. While most of the Amazon sellers are not technical junkies, the algorithm which ranks products on Amazon named A9, has got the whole online marketplace fraternity talking about it. All because of the factors which it uses to rank a product higher on Amazon. While Amazon has always played it safe and never revealed the actual factors behind, but they did went on-board to say that a sales rank is mainly influenced by the number of sales earned by the product itself. In simple terms, “a product which sells more, ranks higher”. Amazon updates the sales rank quite frequently, in most cases Bestseller rank is updated every hour. At this frequency, one thing is clear that recent sales do have a good amount of weight when Amazon sales rank calculator updates the BSR of products. A perception exists in the minds of some of the Amazon sellers, that a product which ranks higher must be a great seller and can be a safe bet to place. While that perception is wrong by a pretty big margin, Amazon sales rank can never predict what would actually be the fate of the product in the market. What if a product ranked higher was just old enough and now a budding, upgraded or cheaper product of similar nature has hit the market and just started cementing its position? You never know, you simply never know. AMZ Insight also provides the estimated sales and revenue of the products but our intelligent Amazon sales estimator do not predict future sales. However, data graph line can shows previous trend which can help you get the idea of future selling trends. You will get the sales estimates based on the current BSR of the item which will change with the change in BSR of the product. Sales rank analysis are really important especially if you’re a beginner or you’re planning to add more products to your portfolio. Underestimating a product’s performance solely on the base of its sales rank, can simply be deadly. This is an important factor, especially in the last quarter sales. Season focused products can really prove you wrong with their sales ranks. At the start of the favorable season, this product (season oriented that is) will start gaining the initial sales traction. As soon as the season comes to its full swing, this product will really stand out the victorious. So, its not recommended to underestimate the selling potential of competitor’s item due to poor BSR rating, especially in case of seasonal items. The above-mentioned equation is simple yet very important. Analyzing the product reviews with product rankings is really important. Product reviews and ratings can simply be termed as indirect marketing. Most of the buyers are influenced by the product reviews and ratings posted about a product. More importantly, a product with more reviews and ratings is likely to sustain more as compared to a product with lower ratings and reviews. This is where Amazon Super URL come into play. Super URLs divert the external traffic directly to your product page. It tries to manipulate the click through by integrating the target keyword and merchant id into the URL. It makes Amazon think that the sale is made via Amazon, and thus results in the sales rank to increase. Simple yet effective. 1. Keywords Research: the first step in improving sales is the keywords research. Find the top keywords for your listings by using Amazon keyword tool, Google keywords planner and your competitor’s listing. Carefully add long tail keywords in the listing because people who search such keywords have the high intention to buy the product. 2. Improve Product Listing: After completing the keywords research next step is Amazon listing optimization with those keywords. Take the most important and top keywords and place in title field. Then comes the bullet points, use secondary keywords and place one keyword in each bullet point. Thirdly, in the description filed you can use long tail and less important keywords. Backend search terms field is also important as it tells Amazon what your listing is all about. You should also place target keywords in this field. Don’t repeated a keyword in any of the text field as it won’t do any favor to your listing. 3. Repricing Product Frequently: Amazon price tracker tool is very important to continuously monitor the competitor’s pricing strategy. In case of tough competition you should tend to reprice the item towards the lower end for a certain time. You can also increase price instead of decreasing but it totally depends upon the season, demand and competition. These adjustment can help you in winning the buy box more often. 4. Promotions: Product promotions help in increasing the sales in a short period of time. Each sales mean increase in the sales rank that further increases your sales. Regular promotions help in pushing the sales rank consistently. 5. Amazon PPC Campaign: While running Amazon PPC campaign or external ad campaign on Google or Facebook, you should continuously monitor which keywords work best to bring in traffic and sales. Always update the contents of your Amazon ads and use specific keywords to improve ranking so you can focus more and more keywords. As a seller you need to continuously keep an eye on the sales rank of the product listings. To predict the competitors’ sales rank you can use Amazon sales rank estimator that will track the sales rank. It is displayed in easy graphical format and helps you understand the downward or upward trends. Based on that information you can make necessary changes in your strategy to counter the competition well ahead of time.